Growing up in my family, my mom was usually the cook, but my dad had domain over a few areas. Soups are definitely his masterpieces; his split pea soup is high on my list of favourites. 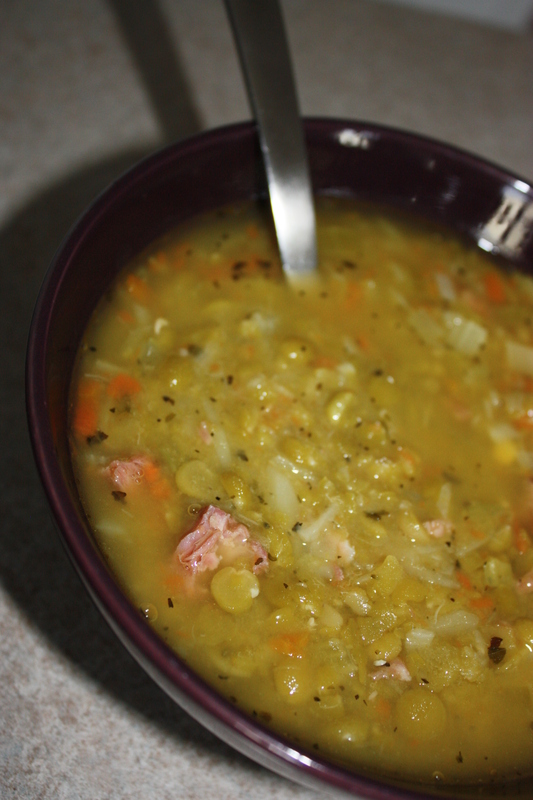 Pea soup is a common soup across many cultures, and perhaps it is not a particularly Dutch dish, but it is did make a regular appearance in our house. Dutch Pea soup, called Snert, is an especially thick and hearty version—for some Snert is only successful when it is thick enough for your spoon to stand in. When I made this with my dad, I captured the recipe as he made it that day, but when dad cooks, it is a free and variable art form. Dad learned from his mom Frankje. When you make this feel free to use the vegetables at hand and change up the amounts as you like. I don’t think I have ever had the exact same soup at dad’s table varying slightly in flavour and thickness but it is invariably good and the taste of home. Simmer left over ham bone in large soup pot for 1-2 hours. Just cover with water. Leave some ham on the bone for cooking. The bone marrow and meat will create meat broth. You can also use pigs’ feet to create broth. 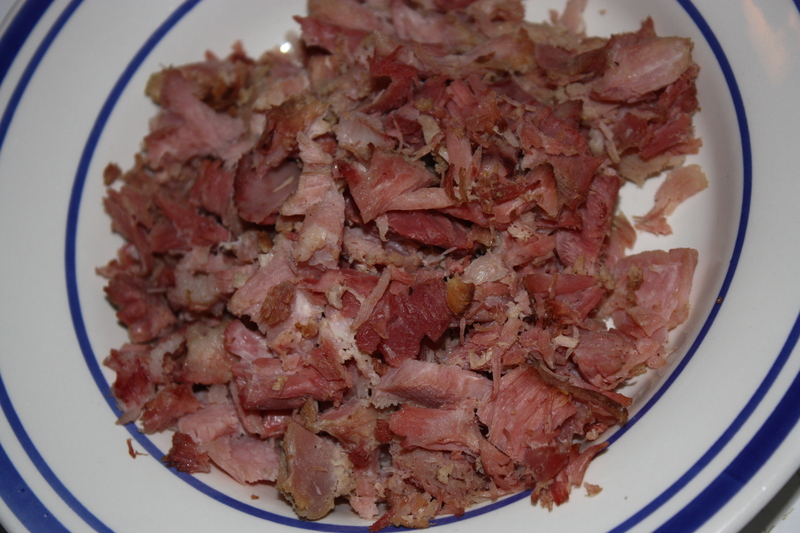 Remove ham bone and pull off small bits of ham. It should come off bone easily. Discard bone and keep the meat for the soup. Soak the split peas overnight in ham broth. 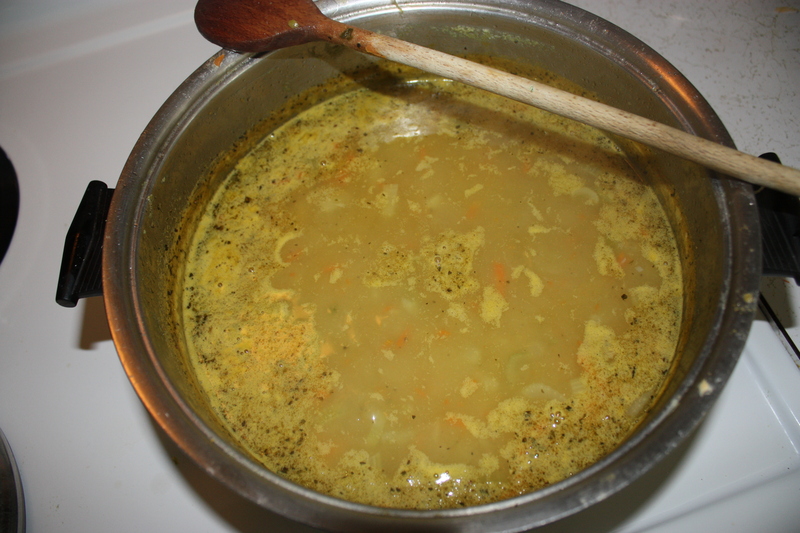 Put soaked peas and broth on stove at medium heat. Dice onions/leeks and celery. Grate carrots and broccoli stems. Add to soup. Feel free to alter the amounts and types of vegetables for the soup. 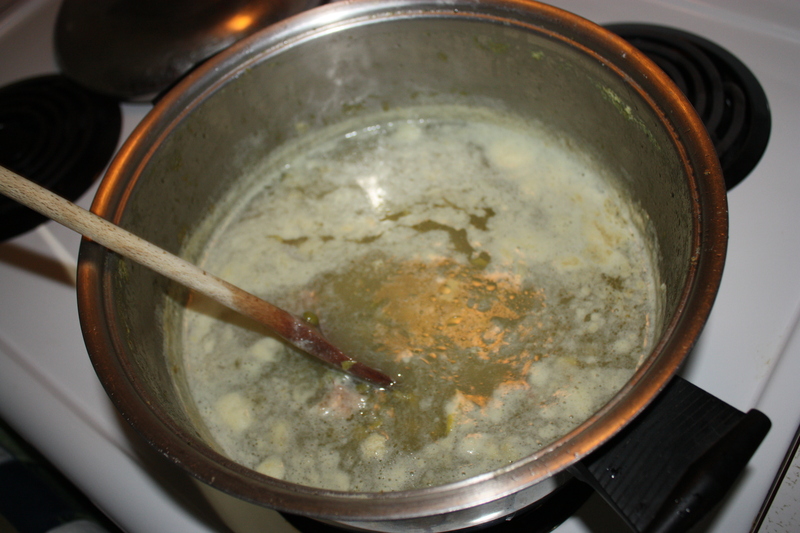 Add bay leaves, garlic, pepper, and parsley to broth. Hold off on adding salt until later because there is often enough salt in ham. Simmer over medium heat for 30 minutes. Add grated potatoes. This will thicken the soup. Simmer for at least another 60 minutes. Make sure the peas are soft and cooked through. Taste test and add salt or adjust other spices as required.